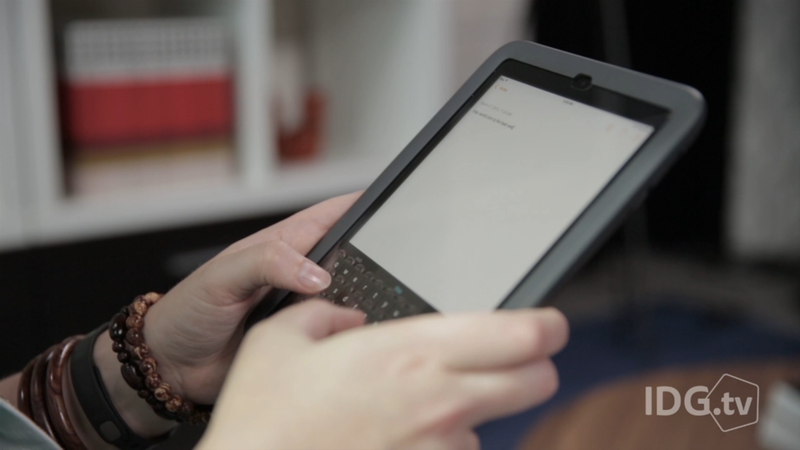 The Phorm case, from Tactus, adds a tactile layer to the software keyboard when you’re holding your iPad mini in portrait mode and engage the switch on the back—supposedly being able to “feel” the keys will make it easier to type. I admit it, I was skeptical. I pictured bulging bubbles right on top of each letter, having to mash those bubbles with my thumbs, and seeing my iPad mini’s battery life suffer, because of course a case with an on/off switch requires power, right? First of all, Phorm uses no power. 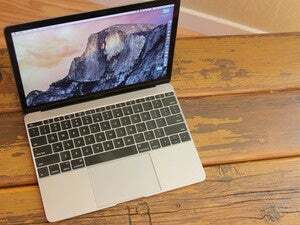 The switch on the back is purely mechanical. 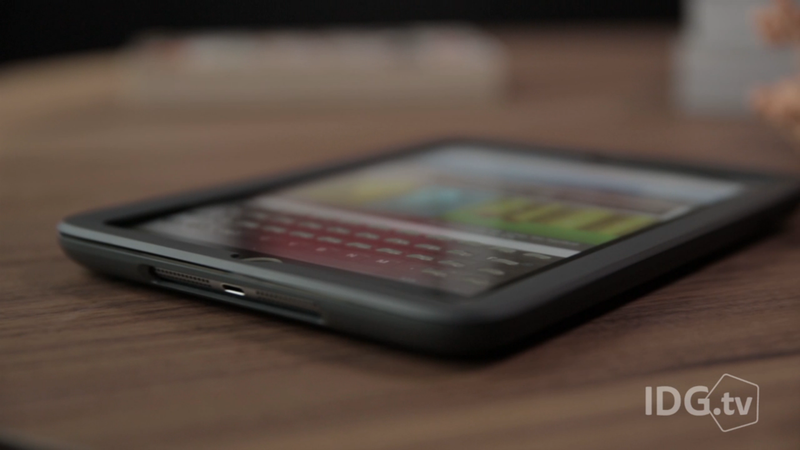 The case, which completely encloses your iPad mini without adding too much bulk or weight, has a thin, double-layered membrane over the screen, and a tiny reservoir built in to the side of the case that holds a small amount of liquid. The switch on the back is completely mechanical—when you push it from one side to the other, the liquid is physically forced out of the reservoir into tiny channels between the two membrane layers, where it settles into place above each key on a standard software keyboard. The Phorm requires no charging, no pairing, and doesn't block your Lightning port. Yes, the bumps are slightly above the keys, not right on top of the letter you’re aiming at with your thumb. The liquid creates small bumps shaped like little crescent moons, that act more as borders for the keys, guiding your fingers to the sweet spot. But you’re not hitting the bubble itself. (And even if you do, it isn’t soft or mushy.) If your thumbs happen to strike the keyboard between keys, they won’t feel that guide there, and it really did seem to train me to hit the right spot. Think of Phorm’s bumps like training wheels for your thumbs, rather than physical keys you’ll need to push down. Phorm only works in portrait mode—getting it to work in landscape would require separate channels and probably a second reservoir of liquid. But Phorm makes more sense in portrait mode on the iPad mini, since that device is narrow enough that you can hold it and comfortably type with your thumbs. Plenty of external keyboards exist to use the iPad mini in landscape orientation, but since the device is smaller than the iPad Air, I tend to find them a little cramped. I found that the guides did make it easier to type. Color me surprised! And Phorm has some advantages over an external Bluetooth keyboard, too. When you use a Bluetooth keyboard, you don’t get the predictive text features you get with the software keyboard, not to mention the shortcuts (holding down the period to get “.com” and “.net,” for example) and special characters. Tactus is taking orders for the Phorm now. The iPad mini case comes in slate gray (gray and black) or sky gray (gray and white) for $99, and ships this summer. Next up is a version for iPhone 6 Plus. And Tactus doesn’t plan to stop there. The company even has a prototype Android tablet with the technology built right in—it’s lighter than a similarly sized tablet since the Phorm’s membrane replaces the topmost glass layer over the screen. Better yet, the technology is tied into the OS, so there’s no switch to flip—the bumps come up automatically whenever the keyboard comes on screen, and fade away again when the keyboard goes away. If you do a lot of thumb-typing on an iPad mini, Phorm’s guides could speed you up and provide a satisfying tactile experience. It’s definitely a niche product, but I’m glad my initial skepticism was proved wrong.